Cumberland Buildings takes pride in our strong network of local dealers. 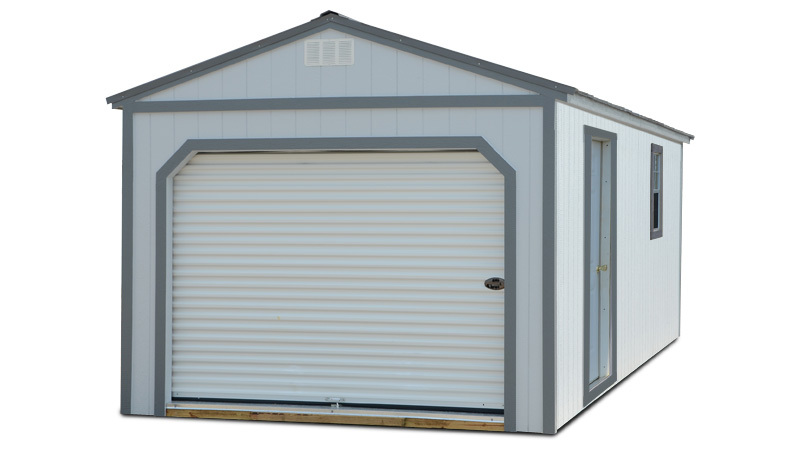 You can get any of Cumberland Buildings’ portable storage buildings with fir wood siding. This siding is great if you appreciate the natural wood look. Also, fir siding blends in well with wooded lots or rural areas so as not to have it stand out. We stain and water seal the fir siding using Honey Gold Olympic stain. Treated wood joists and skids have a limited lifetime manufacturer warranty against termites and fungal decay. Portable storage buildings can stick out like a sore thumb, especially in a residential setting. LP® SmartSide® painted panels allows you to closely coordinate their color to your home or business. These engineered wood panels give you the beautiful look of cedar wood along with the incredible durability of engineered wood. How great is that? They resist decay, fungi and termites in the harshest conditions. To top it off, the manufacturer provides a 5-year 100% labor and replacement warranty and a 50-year prorated limited material warranty. Why should you choose Cumberland Buildings’ portable storage buildings over other companies’ offerings? Simple – quality materials and construction, great price / payment options, warranties and free delivery. Cumberland Buildings has numerous authorized dealers throughout Colorado, Utah, Wyoming, Nebraska and southern Nevada to assist you with your home and business storage needs.